"Your success now is our country’s success. I am rooting hard for you," he said. It was a letter from a kindred spirit. On Jan. 20, 1993, as newly inaugurated President Bill Clinton read outgoing President H.W. Bush's words — left for him inside a desk in the Oval Office — the burgeoning connection between the once-political rivals became inked on stationery beneath an embossed presidential seal. 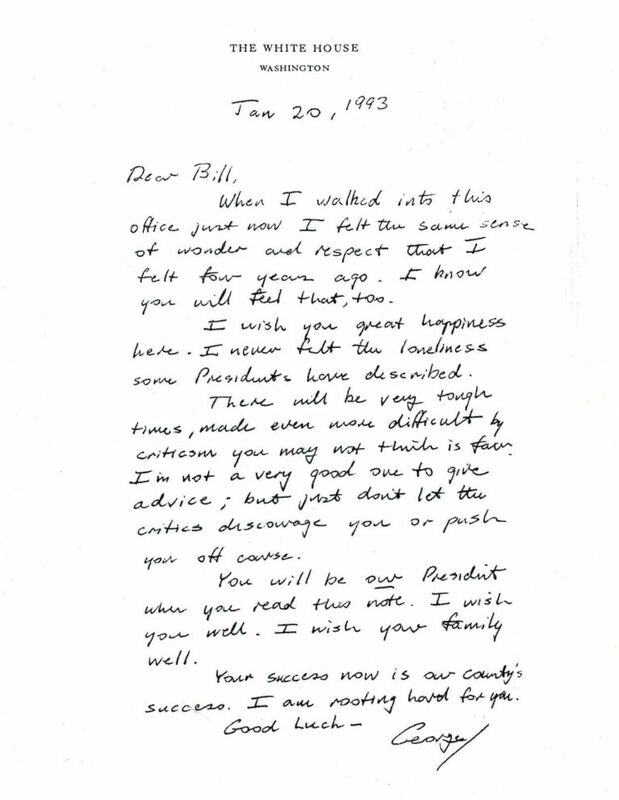 "Dear Bill," the letter began. "When I walked into this office just now, I felt the same sense of wonder and respect that I felt four years ago. I know you will feel that, too. (David Hume Kennerly/Getty Images, FILE) President George H.W. 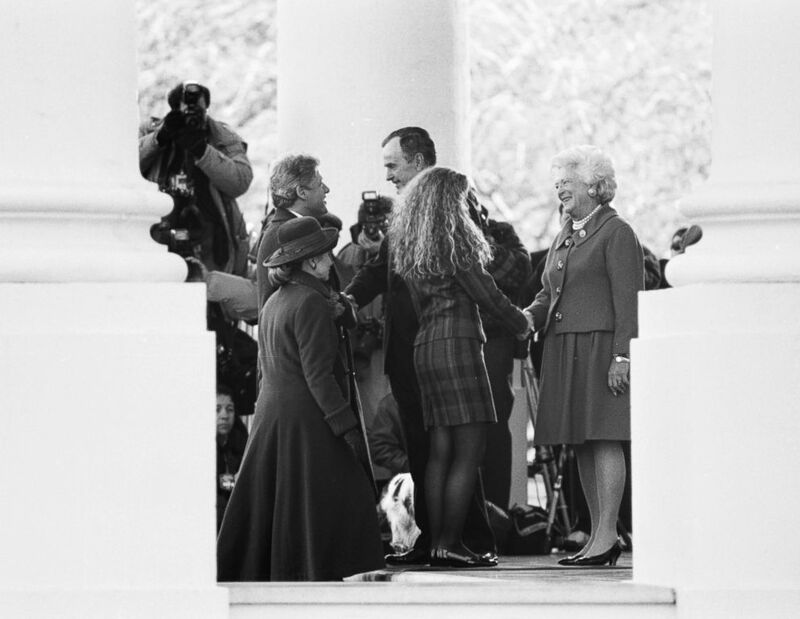 Bush and First Lady Barbara Bush greet the Clintons as they arrive at the White House before the first inauguration of Bill Clinton, 1993. For Clinton, who would go on to serve two terms in office, Bush's words spoke to both his generous spirit and his profound sense of patriotism. In 1992, Clinton defeated Bush in his re-election bid amid a weakened national economy and his own broken promise not to raise taxes. "I love that letter," Clinton told ABC News historian Mark Updegrove just weeks before Bush died. "I thought it was vintage George Bush. I thought he meant it, but I also thought he was trying to be a citizen in the highest sense of the word. It was profoundly moving to me personally." 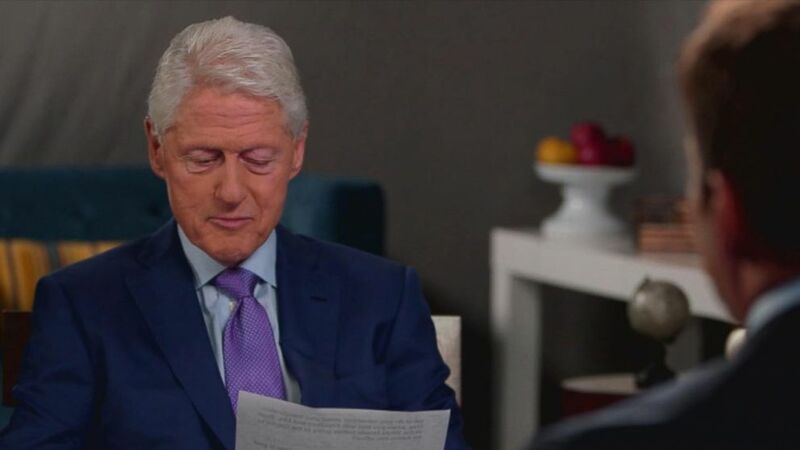 Clinton sat down with ABC News to discuss the presidential tradition established by former President Reagan: leaving a handwritten note for the incoming president. Despite what might have seemed like inauspicious beginnings, Bush and Clinton's friendship would span decades as the two men visited each other, worked together on the recovery of storm-ravaged areas and shared similar views on national education goals. (George H.W. Bush Presidential Library and Museum via AP) A note written by George H.W. Bush to Bill Clinton. "His friendship has been one of the great gifts of my life," Clinton wrote in a column for the Washington Post on Saturday. (Chitose Suzuki/AP, FILE) Former Presidents Bill Clinton and George H.W. 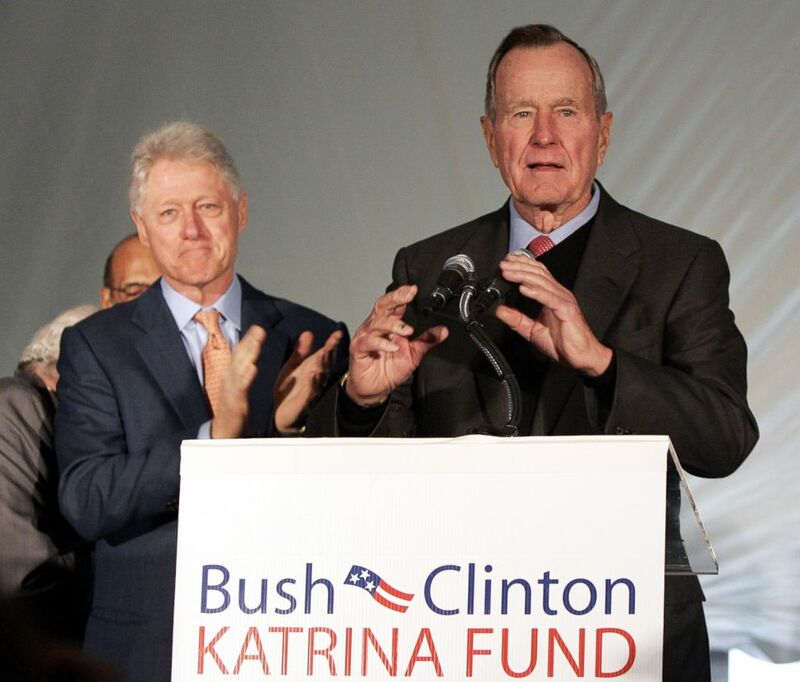 Bush, right, hold a news conference about their fundraising for Hurricane Katrina victims at the University of New Orleans, Dec. 7, 2005 in New Orleans. "From Indonesia to Houston, from the Katrina-ravaged Gulf Coast to Kennebunkport — where just a few months ago we shared our last visit, as he was surrounded by his family but clearly missing Barbara — I cherished every opportunity I had to learn and laugh with him. I just loved him." ABC News' Jesse Convertino contributed.